Lowering distortion in power circuits without compromising their transient response remains a primary problem for designers of audio power amplifiers. 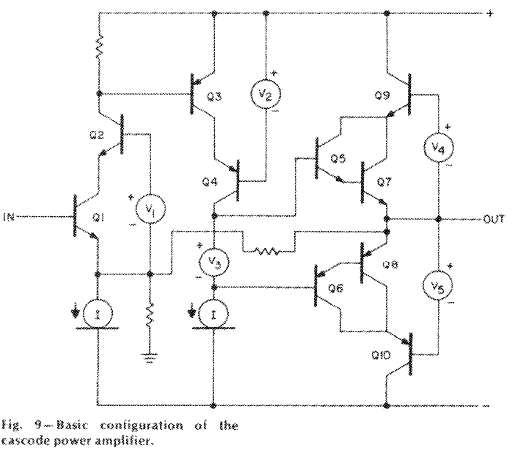 Until fairly recently, the favorite technique for removing distortion components in linear amplifiers was to cascade many gain stages to form a circuit having enormous amounts of gain and then using negative feedback to control the system and correct for the many errors introduced by this large number of components. While the sum of these components' distortions may cause large complex nonlinearities, the correspondingly large amounts of feedback applied are generally more than equal to the task of cleaning up the performance with only one trade-off—the high frequency performance of the system. Because each amplifying device also contributes its own high frequency roll-off, and because the sum of many of these roll-offs creates a complex, multi-pole phase lag, a system using large amounts of negative feedback tends to be unstable at high frequencies, resulting in phenomena popularly referred to as Transient Intermodulation Distortion (TIM). As this phenomena has been well described elsewhere, it will be sufficient here to point out that two solutions to TIM problems exist. The first solution is to not require any high frequency performance of the circuit, that is, not to feed it high frequency signals it cannot handle. While this solution works very well for many operational amplifier applications requiring only low frequency performance, it is judged to be unacceptable in high-fidelity applications where frequency response is required beyond 100 kiloHertz. Although human hearing is generally very poor above 20,000 Hertz, ultrasonic frequency roll-offs produce phase and amplitude effects in the audible region; for example, a single pole (6dB/octave) roll-off at 30 kHz produces about 9 phase lag and 0.5 dB loss at 10 kHz. The effects may be subtle, but their audibility is undesirable in a piece of equipment whose performance is judged by its neutrality. between the parallel lines is unequal, reflecting gain changes with different currents through the transistor, and that they are curved off the horizontal axis, showing gain changes dependent on the voltage across the device. As the transistor wanders through these regions in reproducing the audio signal, its gain alters, causing both harmonic and intermodulation distortion effects. If we can limit the region of operation on this curve, particularly to the area away from the boundaries, the distortion will be significantly reduced. 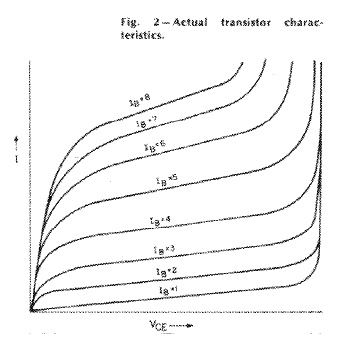 Recently, the most effective method employed for reducing distortion without feedback has been the use of class-A operation, in which the amplifying devices are idled at very high currents, keeping the transistor in a region on the curve where the nonlinearities are less spectacular, as shown in Fig. 3. While the characteristics of the transistor are less than perfect, the distortions within the boundaries shown are relatively mild as compared with the more abrupt gain changes outside of the dotted lines. At great expense of efficiency, class-A operation reduces nonlinearities due to current fluctuations through the transistor. However, it does not affect nonlinearities in the transistor due to voltage changes. There is a method for eliminating such nonlinearities called cascode operation, where the voltage across the transistor, tubes, or FETS is frozen at a constant value, completely eliminating voltage-induced distortions. 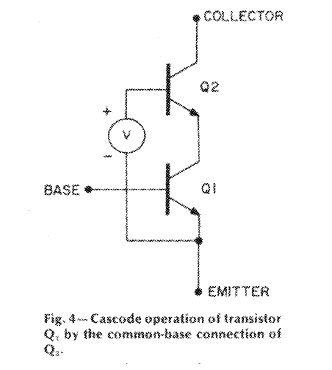 In the case of transistors, the gain device can be operated in commonemitter or common-collector modes that utilizes a second transistor in the common base mode whose emitter is connected to the collector of the gain transistor, as in Fig. 4. Having essentially unity current gain, extremely wide bandwidth, and no distortion, the common base device shields the gain transistor from voltage changes in the circuit. 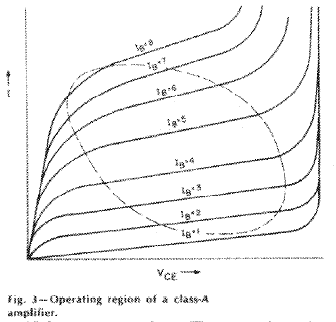 Figure 5 shows the operating boundaries of such a system, where the operating voltage is frozen to a constant. Because of this bandwidth requirement, designers of state-of-the-art amplifiers are turning to the other solution; simple circuits having few amplifying devices and relatively low open loop gain. The simplicity and low gain allows the circuitry to respond to signals very quickly, thus eliminating transient problems, but it does so at the expense of higher harmonic and intermodulation distortions. Because these distortions are more "musical" (having low orders of harmonics and intermodulation sidebands), they are less offensive than TIM effects, whose high order sidebands bear less resemblance to the naturally occurring harmonics in the music. Musical or not, the lower order harmonics and sidebands still deserve to be removed, and the attention of the best designers has turned to removing the distortions in the individual amplifying devices themselves, instead of applying corrective feedback to the system. To understand the approach to this problem, it is first necessary to note that all distortions arise when the gain of an amplifying device is altered. A perfectly linear device has a transfer curve which is a perfectly straight line. Any deviations (distortion) from this straight line is the result of a gain factor which varies depending upon the operating conditions. In real life, the gain of a transistor, tube, or FET changes as the voltage across the device changes and as the current through the device changes. As these conditions fluctuate, the device generates distortion, but if we hold these conditions to a constant, the device becomes distortionless. 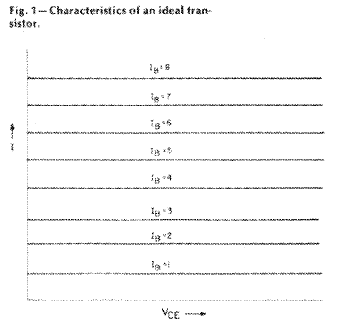 Figure 6 shows the effective transfer characteristics of such a system, and we see that it more nearly approximates the curves of the ideal transistor in Fig. 1. A graphic demonstration of the effectiveness of such an arrangement is clearly illustrated by the spectral analysis of a class-A emitter follower operated without feedback. The circuits in Fig. 7 a & b were operated at 15 kHz at +/-5 volts. The spectral analysis of the outputs of each circuit are shown in Fig. 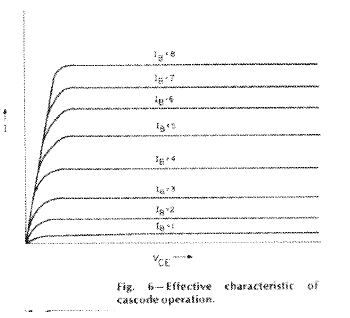 8 a, b, & c, where the vertical scale is 10 dB per division (80 dB), the horizontal scale is 0-100 kHz at 10 kHz division, and as can be easily seen, the cascode operation of the same transistor under otherwise identical conditions results in the reduction of distortion from several per cent to the residual of the test setup. way into preamplifier circuitry as manufactured by Dayton-Wright Paragon, DB Systems, and Audio Directions among others. With all these factors in mind, and noting that the output transistors in power amplifiers would enjoy the beneficial effects of cascode operation, we recently undertook the design of a cascode audio power amplifier (Patent pending) where the gain stages and emitter-follower output stages are operated at constant voltages. The conceptual schematic of such a device can be seen from Fig. 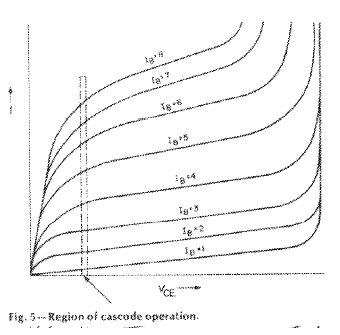 9, which serves to illustrate the use of cascode operation on both the common-emitter voltage gain stage and the common-collector output stage. 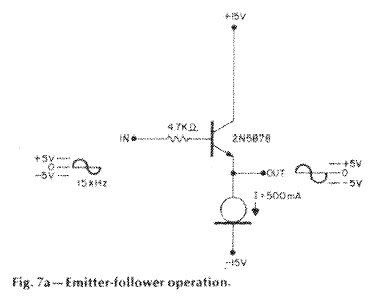 In this circuit, Q1 is the input transistor, held at a constant voltage by Q2. 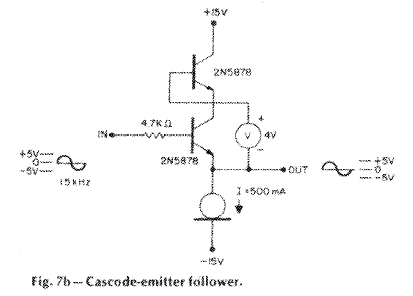 Q3 and Q4 form the cascode common-emitter, voltage-gain stage which generates the full voltage swing of the amplifier. Both parts of the circuit are biased using constant current sources, I1, I2 seen near the negative supply rail. Output current gain is supplied by the complementary common collector darlingtons formed by Q5-8, and Q9 and Q10 are the common base transistors which hold them at constant voltages. V1-5 are constant voltage sources ranging from two to 10 volts. The voltage sources on the cascode circuits can be generated by a number of arbitrary means, including zener diodes, resistors, or even batteries. considerably beyond what the rated power would suggest. This effect is pronounced at high transient levels and imparts a sense of effortlessness in the reproduction of demanding material. While the distortion characteristics of a fully cascode amplifier are not equivalent to those obtained through class-A operation, the lack of signal compression produces a subjective '`ease" to the reproduced sound that closely approximates that of the smooth nonlinearities which characterize class-A operation and are achieved without the cost penalties attendant to a class-A output stage.